We know. You want a bunch of IVEAs at your hospital so you can make your patients happier, your job easier, and your ambulation rates what they ought to be. But the list of competing priorities is long, and time is short. That’s why we’ve just done a complete overhaul of our website, making it easier to access the information that matters most, so your decision makers can quickly find what they need to make a compelling case for the IVEA. You’ll find a wealth of useful information right on the homepage. Go deeper, following our simple navigation, and find videos, case studies and data-based ROI calculations on multiple metrics such as length of stay, hospital-acquired conditions and patient falls. Learn about the IVEA for pediatrics and our smart Mobility Education Program designed to supercharge implementation and adoption. And request our custom Ambulation Audit tool, which will help you quickly assess your department’s ambulation rates. Everywhere we go we meet caregivers who understand the importance of early and frequent patient ambulation but simply don’t have the time and resources to get it done. The IVEA changes that, and the new iveamobility.com makes it easy to understand how. So push ambulation to the top of the list and join the growing number of hospitals using the IVEA to immediately improve patient care and reduce costs. 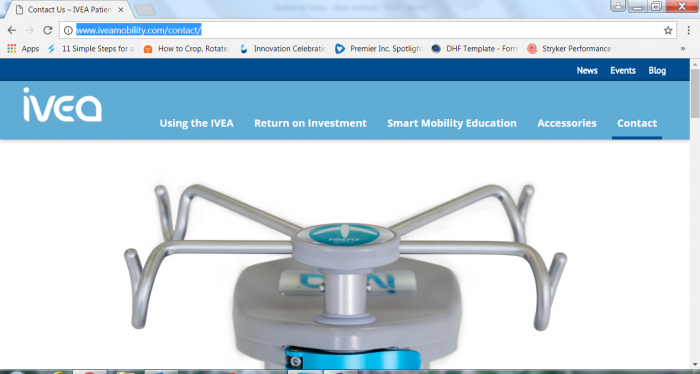 Visit www.iveamobility.com today and contact us for an IVEA demonstration at your hospital.